Learn more about Whispers of the Old Gods! Join the discussion on our forums! Come discuss Master of Evolution over in our dedicated Master of Evolution discussion topic. If you guys think this is good (which i do), have you checked out Evolve for the same class? Also similar to Recombobulator, except it is the same cost. This is pretty insane, though! He mumbles in America still. Might just be for your language. This card is fcking awesome, Got Deathwing from North Sea Kraken in Arena, god i love this card. 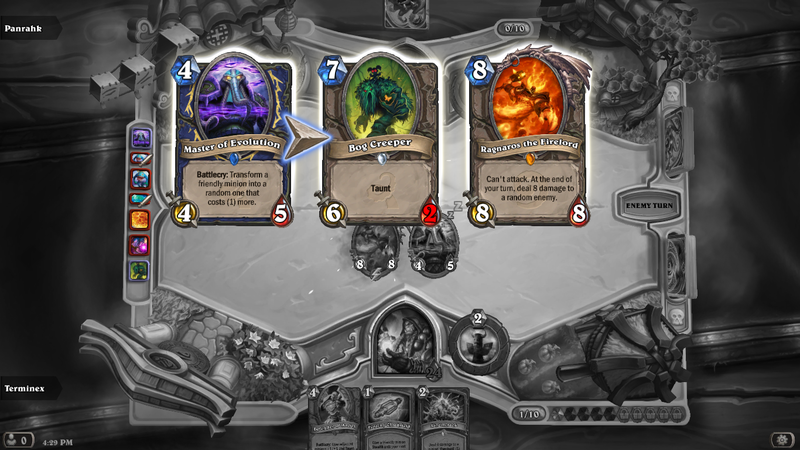 This happened in a Arena btw. In Polish his flavor text says: "He deeply despises creationists". Dem shots fired. T3, Brann. 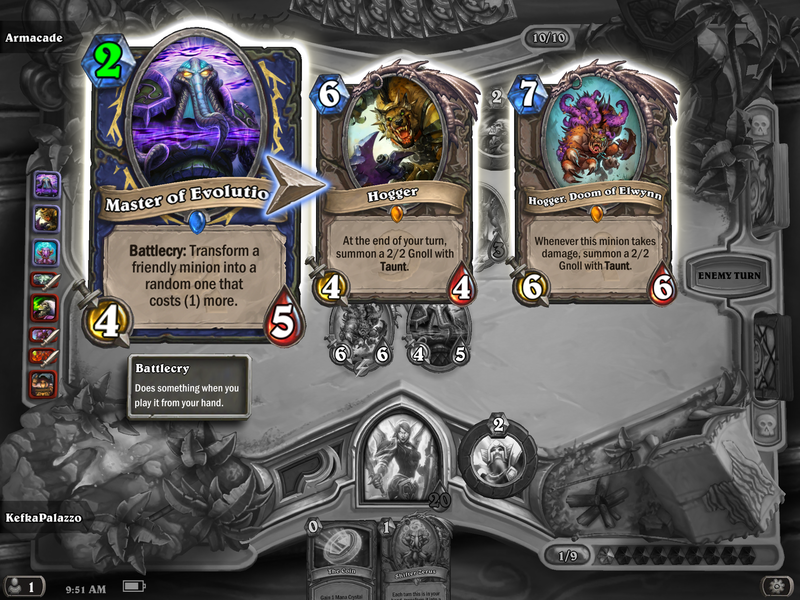 > T4, Master of Evolution, ON Brann. You now have a 5 drop and a 4 drop on turn 4! That's like ramp druid with a coin and double Innervate! Think about this: If Brann is transformed then the battlecry won't trigger again. Are we certain that the effects trigger independently? Do we know that though? Doesn't it only check once for Brann's existance? If Brann is transformed, the battlecry might still happen twice. With Yogg-Saron, Hope's End, even if Brann is killed or removed any other way, the battlecry still triggers twice. 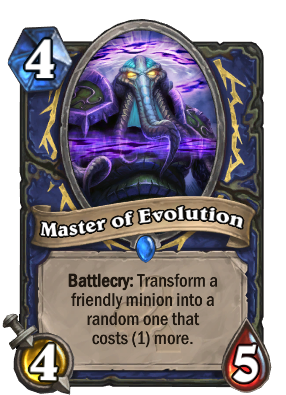 If Brann Bronzebeard works with Yogg-Saron, Hope's End regardless if it dies after the first cast, it should theoretically work with Master of Evolution if it gets transformed. Recombobulator cast on Brann Bronzebeard will still force him to transform twice. Now this, this is a Meta-Defining card! This is easily one of the best cards in the expansion, and combined with the other tools that shaman got, and standard, will most likely make many forms of shaman viable. Its like Evolve, but better. And you're probably thinking, why is this better? Similar to druid, they gave it one of the best stat-lines in the game. SHAMAN TIER 0 CONFIRMED. 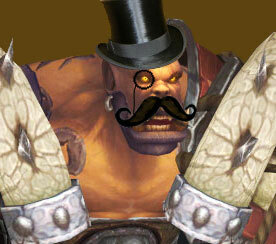 EVIL THRALL WITH A MUSTACHE END BOSS OF LEGION CONFIRMED!!!!! One of my favorite cards from the set. Absolutely gorgeous! I played Trump's Totem Shaman and that was the only time I really enjoyed playing the class. I'm hoping WOG will make me feel like that again.